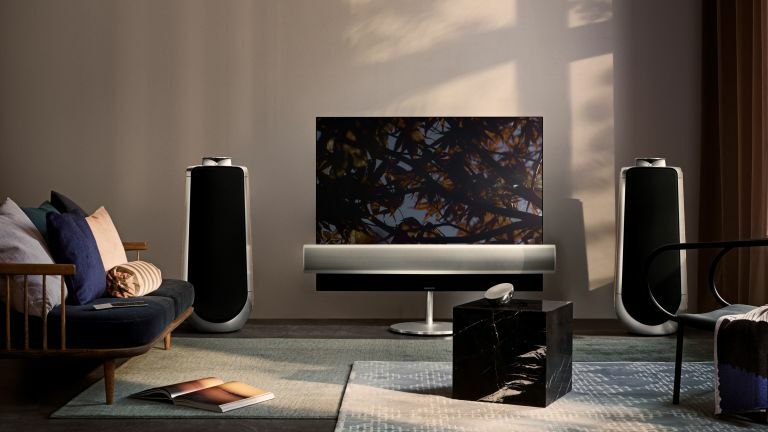 Bang & Olufsen has turned to LG to give its new BeoVision Eclipse a 4K OLED panel that's worthy of the B&O name. Naturally there's LG's pixel dimming control tech on board plus an expanded colour gamut. In terms of audio, there'a an integrated 450 watt 3-channel SoundCentre - the slim glass surface continues beneath the speaker and expands downwards beyond the confines of the screen. BeoVision Eclipse will be available in two sizes – a 55-inch version costing £8,290 and a 65-inch version at £11,590. Design is obviously crucial here though, and customers can even customise the speaker front by choosing either aluminium or coloured fabrics. There's a motorized floor stand that makes the TV slide soundlessly across the floor, as if it were floating towards you - just push a button. No matter where you are sitting, the TV can be adjusted to better suit where you are. In addition to the floor stand, BeoVision Eclipse can be placed on a motorized or manual wall bracket. Everything is controlled with a personalisable single remote, the BeoRemote One BT. By pushing one of the ‘MyButtons’ for three seconds, you can store access to a source or create a shortcut to content or devices. As you might expect, the Eclipse also features LG's most recent webOS 3.5 smart TV platform, so you can stream content to the screen and watch on demand. Chromecast audio, AirPlay audio and Bluetooth are all built-in for music streaming. Oh, and in case you wondered, future B&O TVs will also use LG's tech.